Migration is, and has always been, a disruptive experience. Freedom from oppression and hope for a better life are counter-balanced by feelings of loss – loss of family members, of a home, of personal belongings. Memories of the migration process itself often fade quickly away in view of the new challenges that await immigrants in their new homelands. This volume asks, and shows, how migration memories have been kept, stored, forgotten, and indeed retrieved in many different archives, in official institutions, in heritage centres, as well as in personal and family collections. 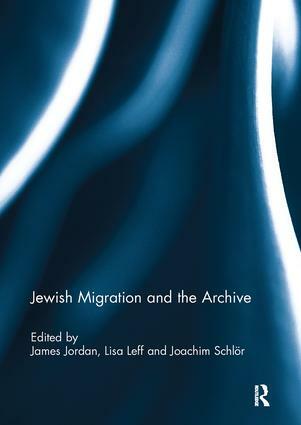 Based on a variety of examples and conceptual approaches – from artistic approaches to the family archive via ‘smell and memory as archives’, to a cultural history of the suitcase – this volume offers a new and original way to write Jewish history and the history of Jewish migration in the context of personal and public memory. The documents reflect the transitory character of the migration experience, and they tell stories of longing and belonging. This book was originally published as a special issue of Jewish Culture and History. James Jordan is Karten Lecturer at the Parkes Institute for the Study of Jewish/non-Jewish Relations at the University of Southampton, UK. He is currently researching the role and representation of Jews in British television (1936-1979). Lisa Leff is an Associate Professor at American University, Washington D.C., USA. She is the author of the forthcoming book The Archive Thief: The Man Who Salvaged French Jewish History in the Wake of the Holocaust. Joachim Schlör is the current director of the Parkes Institute and Professor for Modern Jewish/non-Jewish Relations at the University of Southampton, UK. His book on the Rosenthal family’s emigration from Heilbronn/Germany to England will be published in summer 2015.